We all have at least one bad habit. For me, it is nail biting. No matter how hard I try – including using ‘stop n grow’ and similar products – I just can’t seem to kick it! Each time that my hand goes near my mouth, my loved ones nag me not to.. especially Mrs Scot! This is a habit that I have had for as long as I can remember and I have always put up with; I have never really properly tried to stop. One of the all time biggest loses due to gambling occurred in Las Vegas during 2009. Mr Watanabe is thought to have lost in the range of $127 million over a year long binge. The 52 year old’s loss accounted for over 5% of the casino’s parents company revenue for that year! Whether it be a Saturday night gander at the Casino, a weekly lottery ticket or a weekend sports coupon, gambling costs a lot of money. It is too easy to allow a gambling fund to become part of your weekly expense; why not try going cold turkey by quitting and saving the money towards a weekend break with your friends instead. Guaranteed after your first ‘free’ break, it will make you realise what better things could be done with the cash! Britons actually supposedly spend more on gambling than life insurance and (perhaps a more shocking statistic) more than on fresh fruit or vegetables! My example is far from extreme, but by making your lunch at home and taking coffee into work in a flask… you can already save a significant amount! The takeaway meal can be substituted with a frozen leftover (or supermarket healthier ready meal) at a fraction of the cost. This has huge health benefits in addition to saving money! A couple of hundred quid a month amounts to a couple of thousand a year… that is equivalent to an amazing holiday every single year!!! Holly Francis’s diet consisted of over 6000 calories per day and by the age of 23 she was in excess of 22 stone. She spent £25,000 on takeaway food over an 8 year period and tragically suffered a miscarriage, likely caused by obesity. This led Holly to a complete life change and she lost 11 stone in only 6 months. Read the full story. A miscarriage is an extremely sad way to spur a life change… believe it or not all you need is willpower. Smoking is another habit which costs the earth. I know a lot of friends and other bloggers who have had the willpower to kick this habit, but it is far from easy. My own mother smokes heavily and I am forever battling with her to give up. Unfortunately, you have to want to give up; you need to proactively go about changing habits to truly break them. My mum doesn’t want to stop, so I am already fighting a losing battle. The associated costs of smoking are enormous and governments can’t help but continue to raise taxes and exploit those with the addiction! If you really can’t kick it, consider rollups , ecigs or those handheld vaporizers which are a trend now (Head to a herbal vaporizer maker to learn more about portable vaping). This would help take baby steps to start on the path of finally quitting to smoke conventional cigarettes. Patches and other medication is available to help you beat the cigarette if the willingness is there. If I were a smoker and had a consumption rate of a pack per day, I would save around £170,000 in my lifetime from quitting…. That is the cost of a freaking house!! It is not too late to make a change. Some people might find this hard to believe, but you can actually make a resolution or commitment to change any day of the year! Just because January 1st has passed, it doesn’t mean you have to wait :PAfter all, can you not think of anything better to spend your hard-earned cash on? Do you have any expensive bad habits? Are you planning to kick them in 2018? I feel lucky! 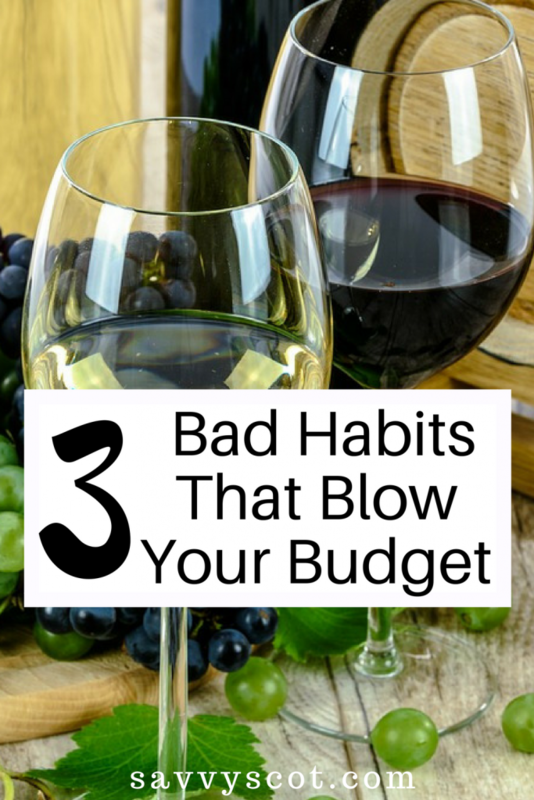 Currently my habits are cheap….if I picked one where I might save a buck is alcohol during meals out….but we eat meals out so infrequently that I enjoy the splurge. I worked with several clients who were addicted to shopping. They really didn’t need anything…they just liked to go and buy stuff. Hey dude… yeah I wouldn’t cut back on the occasional drinks with meals if you enjoy it either! Shopping addiction however… definitely not something I have!! That said, if I get bored I do end up buying stupid things online! haha, our friend was commenting just last week that we were in a good position because we didn’t have any “bad habits.” The amount we spend on alcohol didn’t seem to trouble anyone, haha. They were more talking about the ones like gambling, smoking or dining out to the tune of $3K/month. 3K a month – hon that is my food budget for the WHOLE YEAR!!!! and we eat really well. Would love to see where they are eating out! Ya, I know!! No one in the room actually did that (I don’t think), but the friend who pointed it out spends a LOT eating in restaurants. He’s a single professional who doesn’t like to cook, so he probably has lunch out 4 times a week and dinner 4 times! Pricey. Haha!!! 3K a month is MAD!!!!!!! I’m considering that the husband and I are doing pretty well in this regard. We don’t have any habits that negatively affect our health or finances except my husband’s love for electronics due to his line of work. We used to eat out a few times a week however we’ve been able to cut that down to about 2x/month and maintain it. Good man! I think I maybe came across boring in what I wrote… Believe me, when I drink I go for it and I do still (very occasionally) gamble – I just knwo that I get carried away! Smoking has never interested me and with my addictive personality I reckon it might consume me! As for everything else… YOLO!!! The eating out is something we don’t do often as it just costs too much money. We would rather buy the best products we can and cook something up in our kitchen. I have an allowance so I can buy a coffee or a case of beer (if I save up my allowance) that way it doesn’t blow the budget. I only get $15 a month so don’t jump out your seats.. ha! We also are coming up one year smoke free Jan 29 and ut was the best thing we did for our budget most importantly our health. I am the same dude… I love to buy good quality ingredients and make awesome food (even though I say it myself… right)! I like the idea of having an allowance like that… I bet it makes those coffees even more special right? You were exactly who I was talking about when I made reference to my blogger friends kicking the habit… are you guys going to celebrate your achievement on Tuesday? I’m sure we will do something one year is a long time for a couple who smoked for so many years. We don’t think about it at all anymore but what we do think about is how lucky we were that we had the willpower to say goodbye. Many more people must be wanting to quit as my How we quit smoking blogging series has been busy.. although in January is the time for people to make resolutions and set goals. I hope it motivates and inspires others. Cheers mate. You know I am merrily chipping away at my mortgage? But had a mate in this week who are in a panic because they are on interest only and “will never be able to pay it back” …… both smoke, a pack a day – eep!!! and, well guess if they are serious about paying off their house they know where all their money is going now! They could have 17 romantic weekends in Paris for that kind of money, makes you think. Do you know what.. that is just plain sad isn’t it Elaine. Priorities are so wrong or the importance of repaying mortgages has been mis-communicated somehow. I just wrote today’s post around mortgages and the three things I think are important… very relevant to your friends I think! Agreed – think it has only just hit them that the bank will at some point come knocking for the WHOLE amount – and they are not in a position to repay. I hope they decide to make some better decisions in the future. I’ve fallen foul to all of these, in excess, for years. It is so true they do burn a massive hole in your pocket. When I was on the horses I would think nothing about putting £200 on a race, that £200 seemed like a manageable amount until I lost the race, lost the money, then started thinking about everything that £200 could have bought me. That is EXACTLY what I am talking about! The feeling that you can afford to lose it and don’t care that soon changes to OMG WHAT DID I DO!?! One bad habit I’ve been working to quit is drinking soda. Lately, I’ve been getting caught up in drinking 2 to 3 cans a day which is way to much for me. Over the last couple of weeks I’ve cut down to maybe 2 to 3 cans a week which is a huge improvement over where I was. Hey Chris… It is so easy to get addicted to drinking fizzy juice… all the additives make me crave it too! Good effort on cutting down.. bet you feel a lot more energetic?! I mostly had/have expensive GOOD habits. Yeah I know that’s weird. My old one was my expensive gym. I didn’t want to give it up because I loved it and I actually went, but I couldn’t justify 110/month, so I quit. I missed it a lot at first, but I adjusted. I also have some healthy food items I always buy and would really miss if I didn’t have them. Hard to give up the healthy stuff. I used to eat out more, but that was actually pretty easy to give up. Now it’s a treat. Last night I went out to eat with friends and spent $30. I realized that this was the only time I went this month and I used to go all the time. No wonder I was broke. Now I appreciate the experience so much more. I am always amazed at the cost of cigarettes. I was behind a fellow at the gas station this weekend who bought a few packs and his total was $70! I’m so glad I don’t have any expensive habits. I would be very interesting in hearing your techniques as I need to convince mine to give up!! I hear you on eating out! I love to cook so it’s not that big a deal for me, but dinner and drinks is such a social thing that I rarely pass up on an opportunity to eat out with friends. I do take my lunch to work almost every day, which helps a lot. On days that I don’t, I feel so guilty buying lunch because I know how fast that adds up!